Hotel Food Offers : Best buffets in Bangkok! 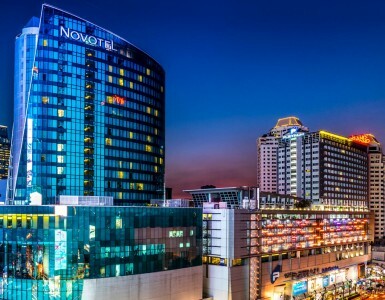 When you’re hungry for quality hotel food offers, Novotel Bangkok Platinum Pratunam should be your first stop! Start big at The SQUARE Restaurant, with generous buffet promotions available with great discounts! Come for the family-friendly Sunday Seafood Brunch, or try the daily dinner buffet, currently featuring fresh River Prawns. A buffet spread at The SQUARE always features the best of many international cuisines. Diners can treat their tastebuds to must-tries: Fresh sashimi and sushi, pizza and pasta, home-made dim sum and the hotel’s signature Chinese meats trio. Live cooking stations always make meals exciting. This is true for the grill station, where prawns, seafood and more are grilled to perfection. 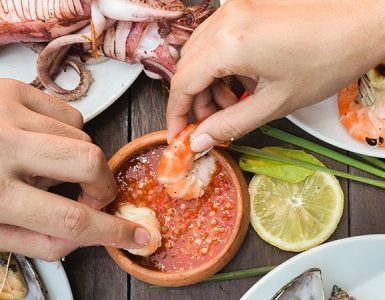 Sunday brunch is the time for seafood lovers to enjoy quality family time and delicious food. An opulent selection of seafood on ice includes oysters, NZ mussels, king crab legs, prawns and more. More seafood such as rock lobster is ready to be grilled with premium meats such as lamb and mixed skewers. It’s not a decadent brunch without foie gras, made to order and delivered table-side, available for Sunday only! The young ones can also play while the adults catch up, thanks to the special kid’s room. If ordering off the menu is preferred, The SQUARE is ready with an extensive a la carte selection. Another all day dining option is chic The Lounge on the 6th floor. Enjoy an exclusive space to order choice Asian and international dishes plated in style. Or, head up to the 9th floor to BAR9 Beer Garden, with warm service, friendly prices and priceless views. BAR9’s cuisine is fresh, fun and perfect to share with friends. Try the classic Platinum Burger, or unique Pad Thai rolls with soft shell crab. As you can see, when it comes to hotel food offers, Novotel Bangkok Platinum Pratunam has it all. Whether you’re a buffet-lover, or looking for a new foodie hangout, you’ll find it here. Accor Plus member can enjoy an extra 10% on top. Call 02-209-1700, email h7272-fb4@accor.com or see www.novotelbangkokplatinum.com for the latest information.